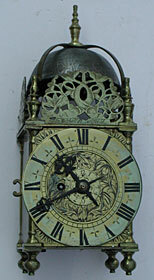 Very fine winged lantern clock with original centre verge escapement, made in the 1680s by the famous Joseph Windmills of London, pictured before restoration. SOLD. 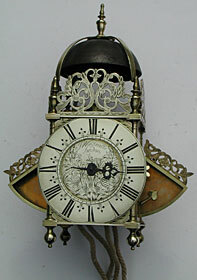 Tiny lantern clock only about 9 inches high and 3 1/2 inches wide made in the 1690s by John Walthall of Hatfield, Hertfordshire, converted later to single-fusee spring-driven movement with passing strike, pictured before restoration. SOLD. 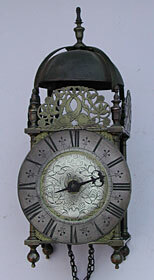 Outstanding lantern clock made in the 1650s by the celebrated Thomas Knifton of London (working from 1640 - died 1667), re-instated balance wheel regulation, pictured before restoration. 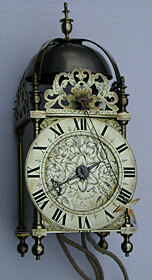 This clock is engraved with the names of the first owners, George and Elizabeth Watte, a feature which is exceptionally rare in a lantern clock. It was probably presented as a wedding gift. SOLD. An exceptionally rare lantern clock by Ahasuerus Fromanteel of London, perhaps the most famous clockmaker of all time, who introduced the pendulum into England in 1658. This clock made originally (pre-1658) with a balance wheel escapement and converted shortly after to a verge pendulum in front of the dial, which was the system used in mainland Europe. SOLD.